First up, we have the iPhone 6 Plus. This is the Apple’s first shot at a larger device or “phablet” and aside from a recording breaking opening weekend, it hasn’t been an easy launch for the iPhone 6 Plus. Controversy aside, let’s find out what makes this thing tick. Starting out with specifications, the iPhone 6 Plus features a 5.5-inch IPS display with a resolution of 1,920 x 1,080 (401 ppi), a dual-core Apple A8 chip clocked at 1.4GHz, a quad-core PowerVR GX6450 GPU, 1GB of RAM, and a 2,915 mAh battery. There’s no denying the marginal update in specifications when compared to previous generation iOS devices, but that doesn’t mean there’s a huge performance gap between the iPhone 6 Plus and Galaxy Note 4. As for the Note 4’s specifications, we have a 5.7-inch QHD Super AMOLED display with a resolution of 2,560 x 1,440 (515 ppi), a quad-core 2.7GHz Snapdragon 805 processor (Exynos variant in some models), Adreno 420 GPU, 3GB of RAM, and a 3,220 mAh battery. On paper, it would seem that the Note 4 is miles faster than the iPhone 6 Plus. Every single detail on that spec sheet points to a better device, but as real world usage has proved in the past, that’s not always the case. Either way, your preference will probably be based on the overall ecosystem and each device’s features/functionality. 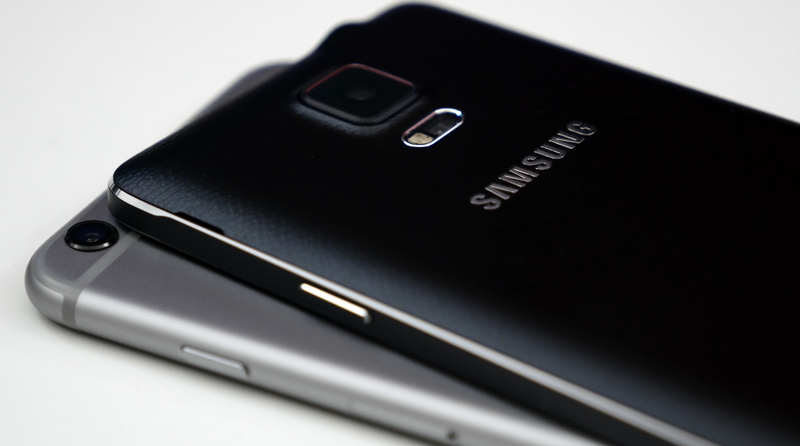 This is one of the first premium built Samsung phones to hit the market. Samsung has taken an entirely different design approach this time around. The Galaxy Note 4’s sleek metal frame feels great in the hand. It’s definitely a step up compared to the Galaxy Note 3, but we’re still left with some plastic elements such as the back cover which hides the battery, Micro SIM card, and MicroSD card slot. As far as layout goes, the front of the Note 4 features an earpiece, the appropriate sensors, a 3.7-megapixel front-facing camera, updated capacitive navigation buttons, and a home button with a built-in fingerprint scanner. On the left side of the Note 4, you’ll find its color-matched volume rocker, while the right side is home to the power button. On the top we have a 3.5mm headphone jack, IR blaster, and a small microphone. At the bottom we have a pair of microphones, Micro USB charging port, and the S Pen. Finally, on the back side you’ll find a 16-megapixel camera with optical image stabilization (up to UHD quality video), LED flash, heart rate sensor, and a small speaker. 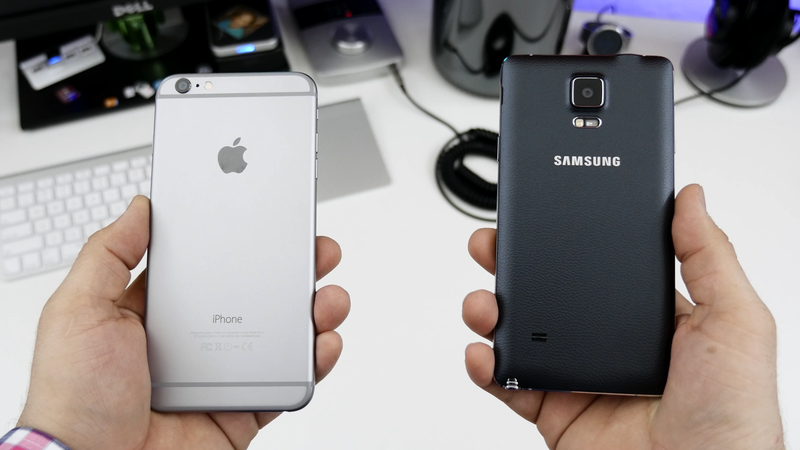 Galaxy Note 4 vs iPhone 6 Plus – design. Moving over to Apple’s iPhone 6 Plus, on the front you’ll find an earpiece, the appropriate sensors, 1.2-megapixel front facing camera, and the circular home button with a built-in fingerprint scanner that Apple calls Touch ID. On the left side of the iPhone 6 Plus we have the sleep/wake button and its Nano SIM card tray, while the right side features volume buttons and a mute switch. You won’t find anything on the top of the iPhone 6 Plus, but the bottom features a microphone, 3.5mm headphone jack, Lightning port for charging, and a small speaker. Lastly, on the back we have an 8-megapixel camera and dual-LED flash with optical image stabilization capable of shooting up to 1080p video at 30/60 frames per second and up to 240 frames per second at 720p. Both devices feature NFC, but Apple is rolling out a new mobile payment platform called Apple Pay which may prove to be useful for iPhone 6 and 6 Plus users. This isn’t the first mobile payment platform to hit the market, but it may be the first one to catch on. Unfortunately, we won’t know for sure until a couple of years have passed. Obviously there’s going to be a big difference between the user experience and features on each device. The iPhone 6 is running iOS 8 which is a very simplistic experience overall. Apple keeps iOS fine-tuned and under control for the most part, but that’s not always a good thing for everyone. Without modifying the software or jailbreaking the device, you’re going to miss out on a lot of the customization options that Android offers. The bottom line is, iOS mostly offers the same software experience on the iPhone 6 Plus as it does on the iPhone 6 and iPhone 5s. I’m not going to get in-depth with the features that iOS 8 brings to the table, but if you’d like to find out more about them check out our top 20 features article. Android and iOS are very different mobile operating systems. With the Samsung Galaxy Note 4, you’re getting a very specific set of features that will only apply to the Note line of smartphones. While these features won’t be for everyone, Samsung’s S Pen will provide an experience like no other smartphone out there, but only if you’re going to take advantage of it. You’ll also be able to multitask with the Galaxy Note 4. This will allow you to open multiple app windows at once or stack one app above another for a split screen experience. I’ve detailed all of the S Pen and multitasking features in our Galaxy Note 4 vs Note 3 article and if you’d like to find out more, check it out here. Galaxy Note 4 mutitasking features. Of course, Samsung’s Android overlay TouchWiz will provide a wide variety of software features that you won’t find on iOS, but some users may find the interface a bit cluttered. 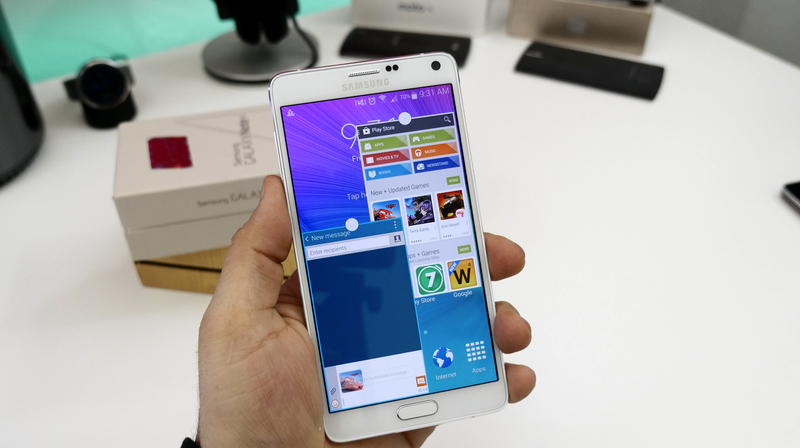 Samsung tends to offer something for everyone within TouchWiz and the Galaxy Note 4 is no different. At the end of the day, the S Pen, multitasking features, new metal frame design, and its 5.7-inch QHD display will be the deciding factors when purchasing a Galaxy Note 4. Do you care about these features? If you’d like to find out more about what the S Pen offers, be sure to check out our Note 4 vs Note 3 comparison article. It’s almost expected that you’ll use the Note 4 with two hands. It’s a very large device that comes with a stylus. If you’re looking for a smartphone that can be easily used with one hand, you may not enjoy the Note 4. 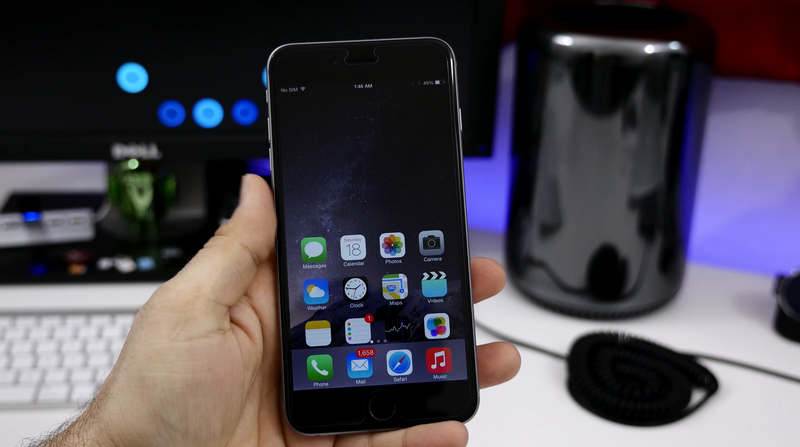 At the same time, you may experience this same issue with the iPhone 6 Plus. iPhone 6 and 6 Plus Reachability. Apple would like you to believe that everything can be done on the iPhone 6 Plus with the combination of one hand and its Reachability feature, though that’s not always true. With a double tap of the home button, iOS will slide the user interface down to the middle of the screen to make the top half of its elements accessible. It’s a handy feature in some cases, but you’re usually better off just using two hands with the device. Also because of their larger sizes, the iPhone 6 Plus and Galaxy Note 4 may be difficult to use if you have smaller hands. It’s widely known that more megapixels doesn’t equal superior picture quality. Both cameras feature optical image stabilization, but Samsung’s Note 4 has a 16-megapixel sensor, while the iPhone 6 Plus comes in with half the specs at just 8-megapixels. Both cameras take excellent pictures. It’ll be hard for most people to tell the difference between each camera in acceptable lighting. The optical image stabilization on both devices help keep pictures crisp and clean, but you may find that the colors and contrast slightly vary between the two. For video, the iPhone 6 Plus shoots 1080p at 30 or 60 frames per second and as we’ve demonstrated in a cinematic camera test, it’s capable of some fantastic quality. With the Galaxy Note 4, you’re getting up to UHD quality video. This camera also proved to be amazing in our recent camera test. If you care about resolution, the Galaxy Note 4 is going to be a clear choice when it comes to the camera, but both devices capture excellent photos and video overall. As I’ve mentioned, this isn’t really a battle between iOS and Android, it’s a battle between what fits your needs the best. With the Galaxy Note 4, you’re getting a good amount of very specific software features along with S Pen functionality, but not everyone will take advantage of them. However, if you need a high quality device with a large 5.7-inch QHD display, it’ll be hard to find that combination at the moment. If you’re looking for simplicity, the iPhone 6 Plus may be the route to go. Apple has a strong grip on its software and services and likes to keep them under a very manageable umbrella. This isn’t a bad thing in any way, and if you’re familiar with other iOS devices you won’t have any trouble figuring out the iPhone 6 Plus. With Samsung and other Android devices, there will be a wide variety of software features that you’ll discover over the course of ownership. 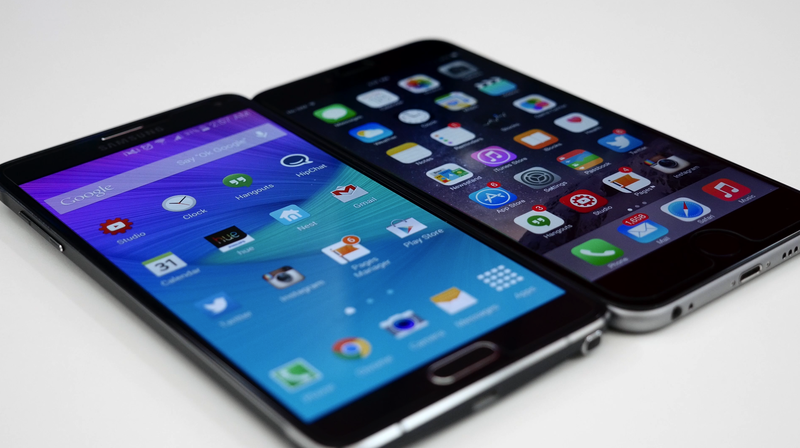 Both Apple and Samsung have made excellent devices here. This decision will come down to which mobile OS you’re invested in the most and whether or not you’ll take advantage of the features that Samsung brings to the table with the Galaxy Note 4. Hopefully we’ve provided enough detail to help you make an informed purchase. It’s obvious that these two devices are designed for completely different personalities, but which one is right for you? Let us know what you think with a comment below.